Welcome to the first running of the Kensington Congregational Church Lobster Loop 5K road race; co-sponsored by Powerhouse Gym of Berlin, and Malibu Fitness of Farmington. For many years, Powerhouse Gym and Malibu Fitness, have been serving the health and fitness needs of thousands of patrons throughout central Connecticut. 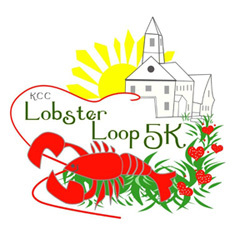 In continuing that tradition, this June they will sponsor the 5K “Lobster Loop” with Kensington Congregational Church. The Lobster Loop takes place within the small historical town of Kensington, Connecticut. This inaugural race will be limited to the first 500 entrants who sign up before June 9th through the on-line portal. Early registration (Before May 1st) is $20.00, from May 1st to June 9th, the registration fee is $25.00. This is Kensington‘s only summer road race and there will be no race day registrations. Check out the beautiful and hilly course that meanders through farm country and historical neighborhoods alike. The race will challenge running enthusiasts, upcoming local talent, as well as top level local runners. T-Shirts will be provided to the first 300 entrants and all runners will receive a one month free membership to Powerhouse Gym or Malibu Fitness by calling +1(860)836-4614. An award ceremony will be held in the parking lot of the church following the 5K race.